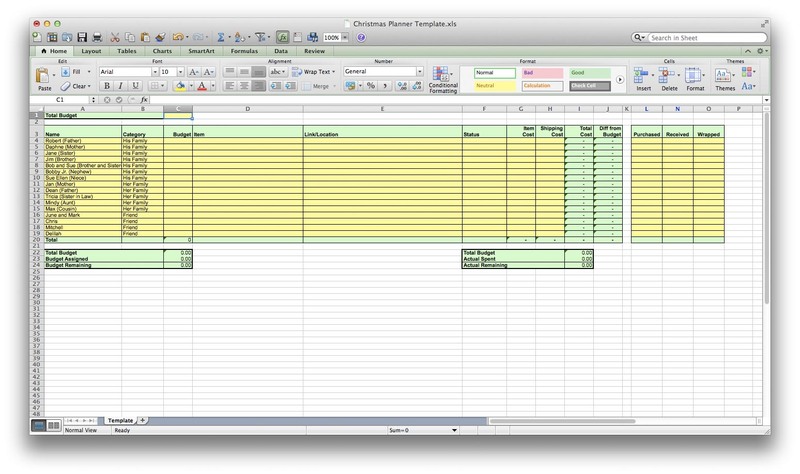 I use a spreadsheet to keep holiday shopping for my ever-expanding family simple and efficient. I add a new tab for each year, and keep the old ones so that I never repeat a gift – and so that we can track how much we spend on holiday gifts each year. Only the yellow areas of the spreadsheet are fillable; the green fields are auto-calculated. I’ve set this up in the way that works for me; I give myself a total anticipated budget for everything, and then assign an individual budget for each person or couple on the list. Then, as I’m shopping, I put everything I find into the spreadsheet, adding rows as necessary. Once I’ve found potential gifts for everyone on the list, my husband and I go over the list together and decide on a final gift(s) for each person. The ones we don’t choose are deleted (although sometimes I take notes on what they were, in case we want to get them for next year or a birthday), and then I go ahead and buy the things we’ve picked. To keep track of my many purchases and the multitude of boxes arriving at my door daily, I have columns for purchase date and date the item was received; because I’m a bit of a control freak, I also have a column for the date the item was wrapped. You can download my spreadsheet for free at the bottom of this page, or just click right here! And here’s another tip: while you may have found an item in a particular catalog or store, make sure to search for it online before you buy; you may be able to find it for less. I often shop for things all over the place, and then make one huge order from Amazon, which has absolutely everything, often for a lower price. And the more items you can get from one destination, the more money you save on combined shipping.